Years ago, I was fortunate enough to travel to Israel for a pilgrimage through the Holy Land. And this upcoming Sunday’s readings reminded me of one of the more interesting experiences I had while I was there. This Sunday’s readings recount Abraham’s servant identifying Rebekah as the woman whom God chose to be Isaac’s wife through Rebekah generously offering to water the servant’s camels at the well. I once had a professor point out just how physically difficult this would have been. Camels drink A LOT of water, and drawing water from a well wasn’t easy. Rebekah, my professor pointed out, must have been something akin to a body-builder in order to accomplish this task. Rebekah was certainly not a dainty, fragile person. She was STRONG. So when we were able to visit Rebekah’s tomb while on our Holy Land pilgrimage, I remembered this story about her. But what struck me more was the unorthodox and unfortunate organization of the tombs of Rebekah, laid beside her husband Isaaic, as well as of Abraham and Sarah, Jacob and Leah. 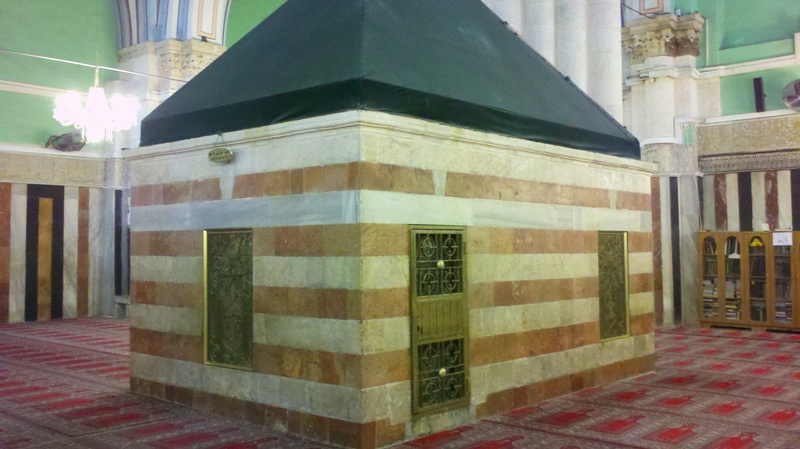 These family members of Abraham are all laid to rest in what is called “The Cave of the Patriarchs,” which resides on the land that Abraham purchased to serve as a burial place for himself and his family. However, even though Abraham and his family share a final resting place, their tombs have been cordoned off from each other due to tensions among Jews, Muslims, and Christians. So if you were to visit The Cave of the Patriarchs, you would find that Jews, Christians, and Muslims may all visit the tomb of Abraham and Sarah, but that Muslims cannot tread upon the land where Jacob and Leah reside, nor can Jews cannot walk upon the land where Isaac and Rebekah are laid to rest. Though the burial places of Rebekah and Isaac have not changed, they have effectively become exiled from the rest of the family in a way, as have Jacob and Leah. Judaism, Christianity, and Islam all claim Abraham as their patriarch, and all revere these early patriarchs and matriarchs in their own way, yet this separation persists. Of course this situation is complicated and not easily rectified, yet it is unfortunate that three faiths that share so much can enter into so much conflict. Above and beyond the symbolic separation we see at The Cave of the Patriarchs, all around the world there are examples of Christians, Muslims, and Jews distrusting, abusing, and even killing one another. We all claim to worship God and claim Abraham and Sarah as our ancestors, yet we are unable to even coexist in many places. The separation we see at The Cave of the Patriarchs runs much deeper than would be expected for groups that proclaim to share so much. May the God of all the nations of the earth bring peace and concord among all peoples, destroying that which divides us and strengthening that which unifies us. Amen.